The PCN was featured on 'Have I Got News For You' - BBC1 - 14th October 2010. More about PCN on HIGNFY here. 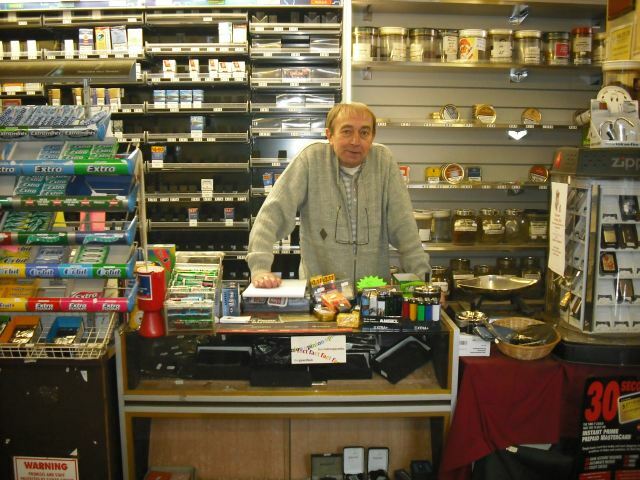 Forty excellent prizes up for grabs thanks to astute purchasing by the secretary who had �215 to spend. 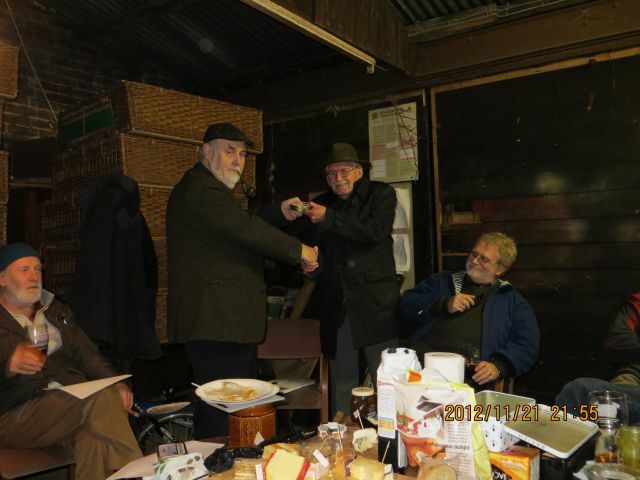 The chairman and secretary seemed to win more than their fair share of prizes as usual. Everyone went home satisfied with their haul of goodies. The club is very sad to report that Frank King (Senior) passed away recently. 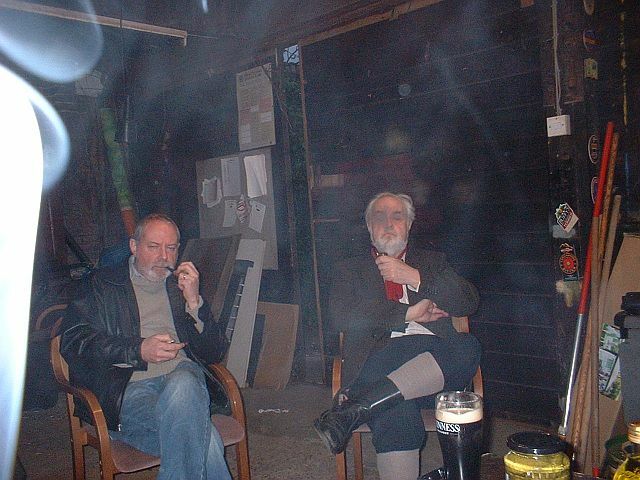 Frank understandably found it difficult to make the meetings held at The Nelson following the closure of the Rosary, but enjoyed his pint in The Wellington, close to his Bullard Road home. 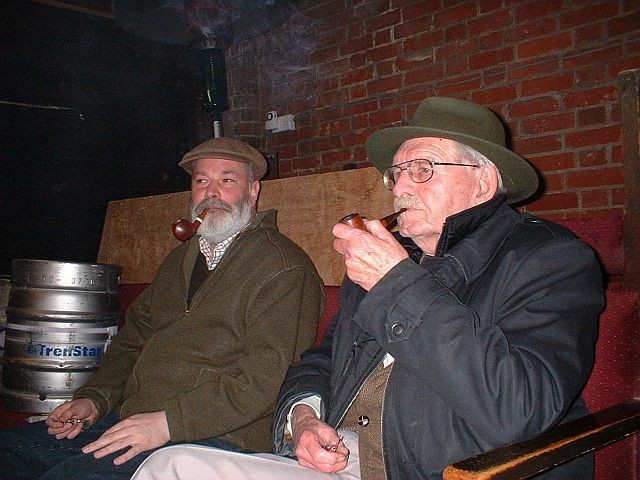 We raise a glass, and puff a pipe, to his memory. KING FRANK WILLIAM suddenly at home on November 30th, aged 89. Much-loved Dad of Frank, Julie and James, dear grandad to Donna and Tim, Sharon and David, Alexandra and Abigail. Will be sadly missed. Funeral service at St. Faiths Crematorium on Tuesday, December 18th, at 10.15am. Family flowers only please but donations if desired for the RAF Benevolent fund may be sent c/o Allcock Family Funeral Services, Falcon House, 96a City Road, Norwich, NR1 2HD. 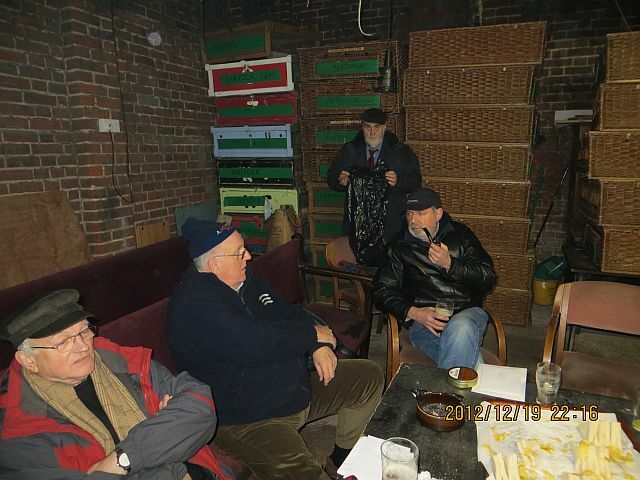 Thanks to John Eason for obtaining an excellent selection of cheeses for the annual cheese and pickles evening. The runner bean pickle went down very well, especially with Tony who spent the night at the Rennies. Congratulations to Keith who won David's excellent quiz about smoking and food. 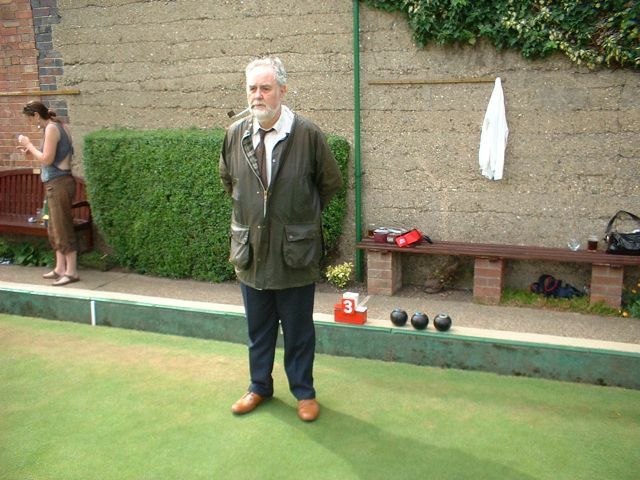 A very creditable victory for Keith Coleman who won four out of four matches. 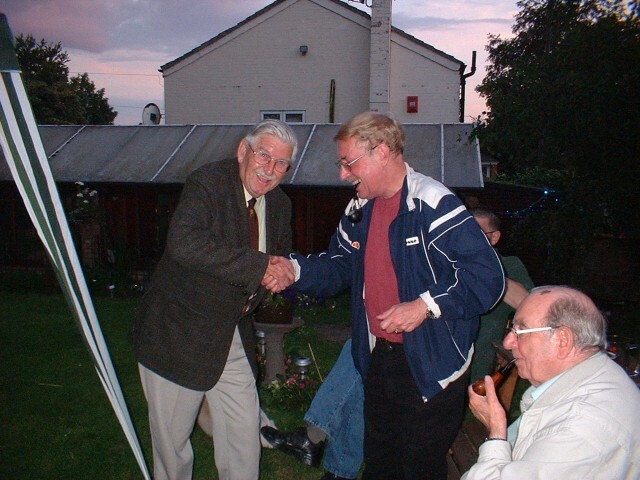 John Walker was the highest scorer with a very lucky 100. A clear winter's evening with a slight breeze blowing from right to left (but only when I was throwing) saw the annual darts competition. The venue was the Nelson, where I'm happy to say the beer is much improved, but even this failed to draw the expected large field of entrants so it was left to only five of us to do battle for the plethora of prize, which the Hon Sec will dig out from under his bed and present to the winner at some point in the (distant) future. The five who did turn up were Keith Coleman, Len Ellis, the Walker Sisters* and myself. Reg Walker claimed that the school nurse had put drops in his eyes and he couldn't see very well. I don't know about you, but I can't stand people who make excuses. But at least he turned up. Unlike Tony Larner who has been on a safari in North Yorkshire and had shot thousands of innocent pheasants and partridges as well as several beaters. He claimed tiredness, but several reports came in from North Norfolk of an undesirable person going door to door trying to sell rotting game birds at exorbitant prices. 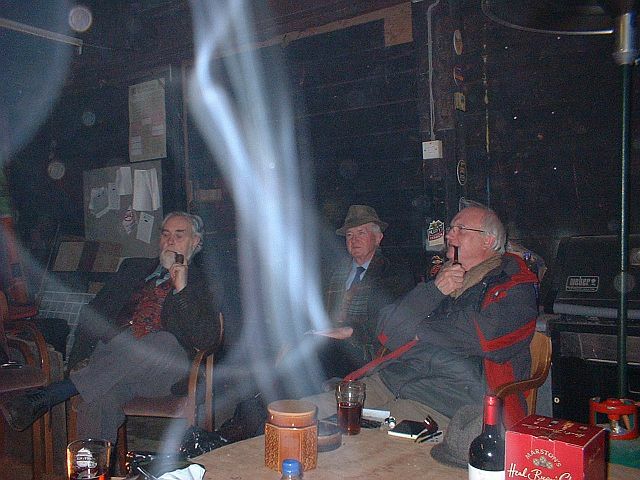 The competition began at about the same time as a meeting started at the other end of the bar. 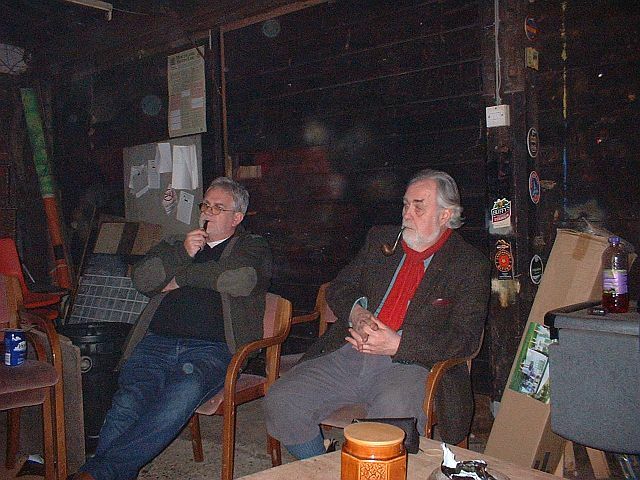 It soon became clear that those throwing the darts should have been holding the meeting (after all with four ex-HMSO people we had light years of experience) while there was no doubt from the scornful looks they gave us that those at the meeting could have won the mythical prize with their eyes closed. But despite the noise and distraction that was corning from the Nelson Street end we battled on in what was to become a darts marathon, that threatened to last beyond licensed hours. And that was just the first tie. 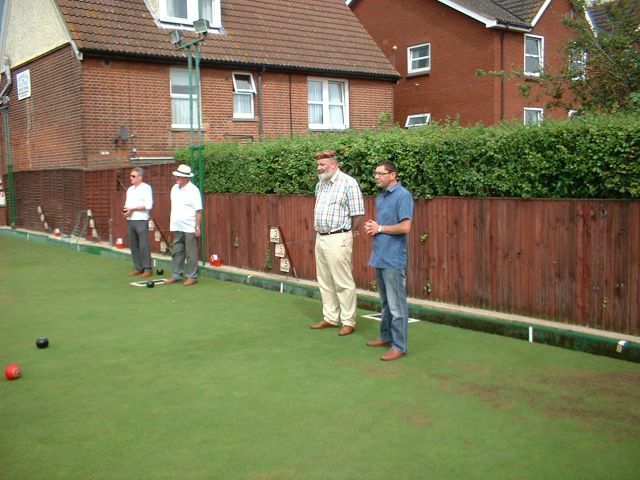 Eventually the competition was won by Keith with a perfect record of four wins. Len was runner-up with three, while Walker Major had two and Walker Minor with a single (lucky) victory was not quite last. I had a perfect record as well, and would have had the highest score of the night when I threw a brilliant one hundred and ten, only to have it disallowed as I had needed one hundred and eleven to finish. So the high score non-prize went to John Walker with a measly one hundred. All good fun, anyway. and I am bound to be much better at next month's cheese and pickles. *So called to avoid confusion with a vintage pop group. 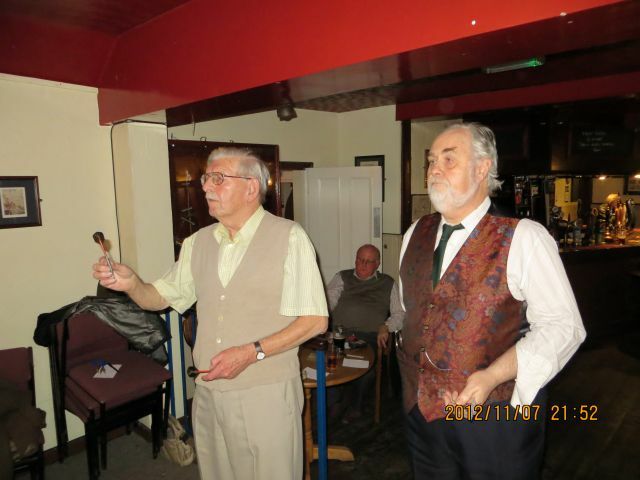 Len at the oche and Keith. John in the background. The 5th Annual Broads Awards took place at the Ferry Inn, Horning on Saturday 3rd November and was a resounding success with over 100 people in attendance who all had a very enjoyable evening. The Ferry provided an excellent carvery dinner followed by the Red Carpet ceremony and entertainment from local band Hard Rain. 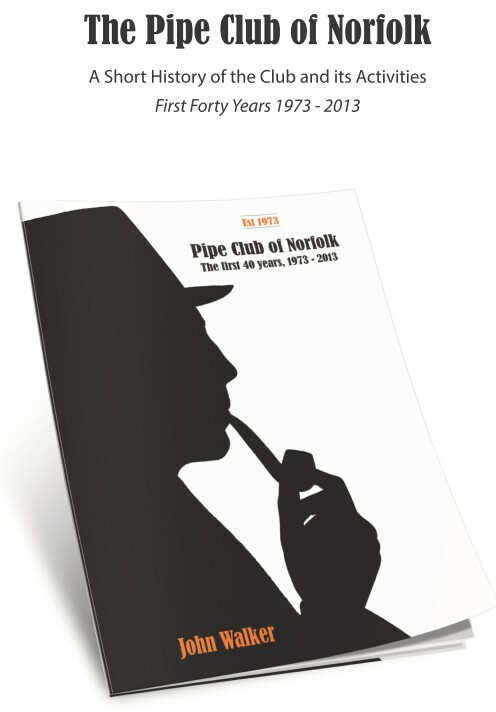 The 'Most Smoker Friendly Pub' award (sponsored by the Pipe Club of Norfolk) was won by The Ship, Reedham. Sunday 15 July dawned bright and clear; just as well as a long journey to Newark on Trent lay ahead, which would usually entail trespassing through fields of cabbages behind assorted lorries, caravans and farm machinery. This trip was no different but at last the Showground hove into view. Yet, was this the place? It was very quiet. No placards proclaiming that 'Newark welcomes Pipesmokers'. 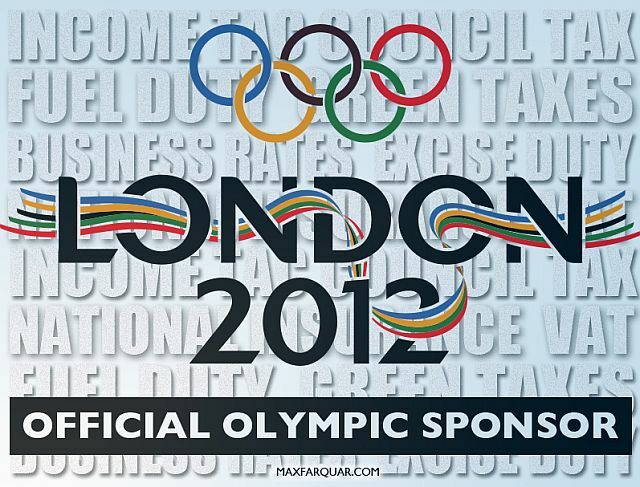 No sponsors flags fluttering gaily from the staffs. Indeed the place was deserted. Now some of you I am sure will have watched 'The Avengers' in your youth and may remember the episode where Steed and Mrs Peel fetch up at an RAF station only to find it deserted save for a sinister milk float. Well, I am sure I heard milk bottles. Back to the plot. After driving aimlessly around for a while, a tent was espied, situated beside a rustic latrine block. Further investigation showed this to be the place as inside was a fair complement of smokers obviously enjoying themselves. Let me set the scene for those unlucky enough not to have attended. One end of the tent was commercial with a number of stalls selling pipes, smoking equipment and fuel. 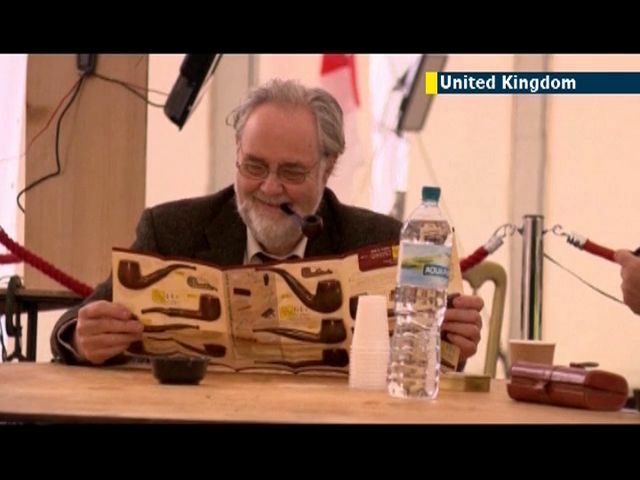 The middle of the tent housed the media centre, where the organisers were in animated conversation with the film crews. Beyond this was the arena where the contest would take place. A sheet attached to a tent post gave the running order but things were running a little behind time and the business did not begin until mid afternoon. Anything approaching a record time would mean a ride home in the dark. The Norfolk contingent where joined at their table by a couple of Spaniards. The one who could speak English remarked that his mate was the Champion of Spain and had won contests all across Europe. So the contest began and an unexpected problem occurred which had the potential to spoil the whole event. The competition rules formulated many years ago stipulated two matches per competitor. No problem in an enclosed environment but in a tent where playful breezes issued through the open side flaps keeping the matches alight was a lottery. Your scribe, like a number of others, had the first match blown out. Faced with a 200 mile round trip for nothing, well the second match had got to work. It was a question of getting something alight somehow. Indeed one may say that the usual practiced ignition techniques had perforce to give way to expediency. That other competitors had suffered similarly was evidenced by the high casualty rates early on in the piece but then things settled down somewhat. 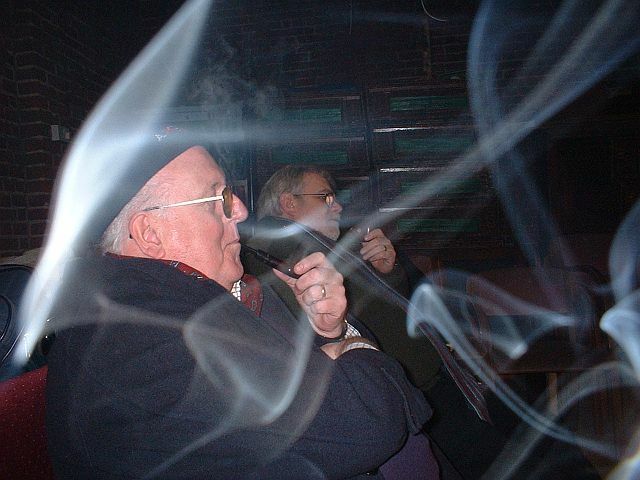 Mr Larner was smoking with confidence while DWK seemed set for a long afternoon. One of the Spaniards had dropped out but the Champion continued deftly guiding his ember round the bowl and occasionally, very occasionally, allowing pipe stem and mouth to enjoy fleeting contact. Mr Larner expired after a fine effort and all of a sudden only two men were left standing, the Spaniard and DWK. At last the media, who had sat bemused through much of the proceedings realised that something exciting was about to happen and sprung into life, film cameras quivering but inches from the competitors glowing bowls. It was at this stage that your correspondent felt it appropriate to examine the latrines and upon return found he had missed the denouement; DWK had gone out and the wily Spaniard had declared his innings closed on 57 mins. Speeches and prize giving followed soon after. Contestants were rewarded handsomely for their efforts while the Champion will travel home with a huge cache of prizes to aid the Spanish economy. 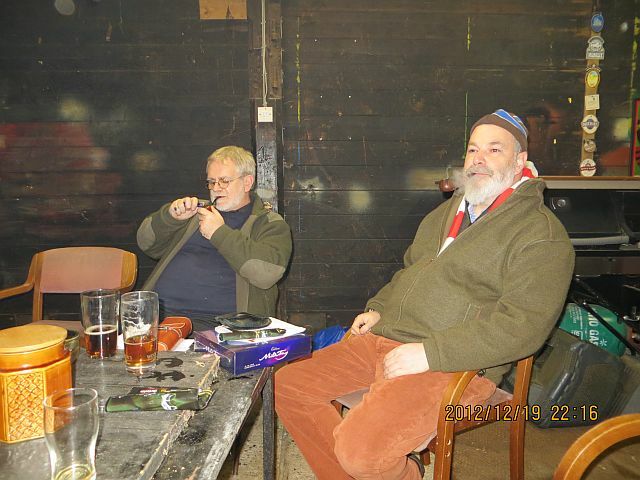 The Nottingham pipe club deservedly won the team prize and a raffle of surplus stock raised a little more for the funds. And so it was time to head home after an enjoyable and historic event. Roll on next year. 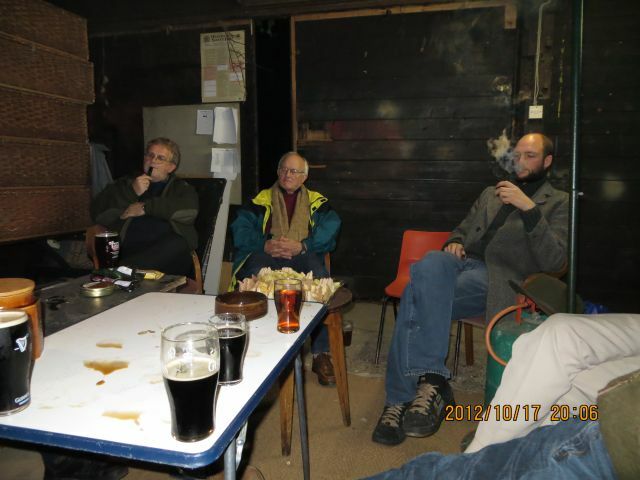 It was nice to see Stuart again and we were delighted to welcome Roger Howard who came to talk to us about tobacco growing. 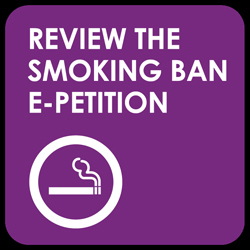 It is perfectly legal to grow tobacco in the UK and you do not have to pay tax on it as long as it is used for personal consumption. If you can grow tomatoes, you should also be able to grow tobacco. The secret is to start the seeds in a greenhouse in about March time. Once established, the plants are resistant to most pests apart from slugs. The difficult part is the curing of the tobacco which is quite a skilled job. A small turnout for this year's clay competition and congratulations to winner Keith Coleman. 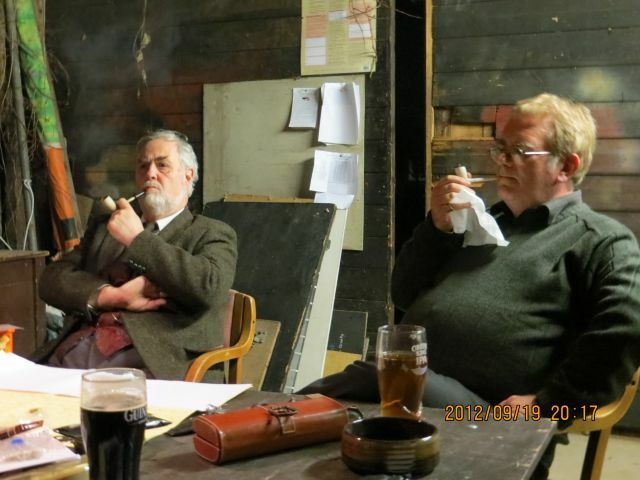 An excellent afternoon at the Morley Club. Thanks to Tony for organising it and congratulations to him for being on the winning team. The weather threatened to disrupt the proceedings but we got under way after a slight delay due to rain. The Morley Club did us proud with an excellent buffet at the end of the event. An excellent quiz by the secretary. That is what most members said. Congrats to David Wollard-Kingston who won and gets to set the next quiz. Sample questions: 12. Blade is a fictional character, a superhero/vampire hunter created by which comic book publisher? 13. Skimmed milk is made when WHAT is removed from whole milk? 14. Which musical instrument does Eric Clapton play? See if you can spot the connections. Free tobacco! 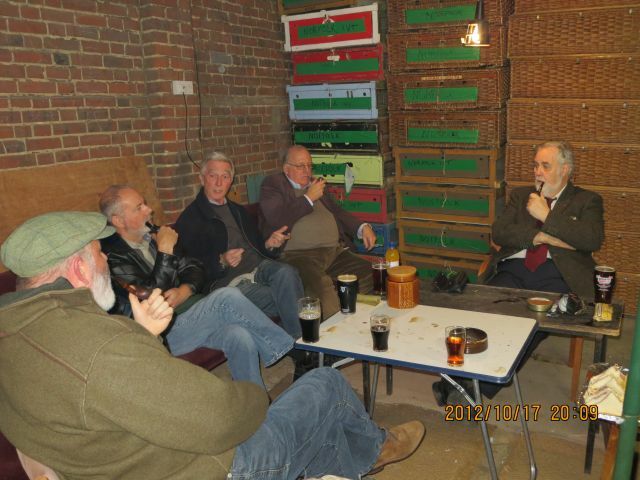 The evening started with the distribution of several packets of (mainly aromatic) tobacco very generously donated by Steve, a former pipe smoker. Those present ended up with at least two packets each. 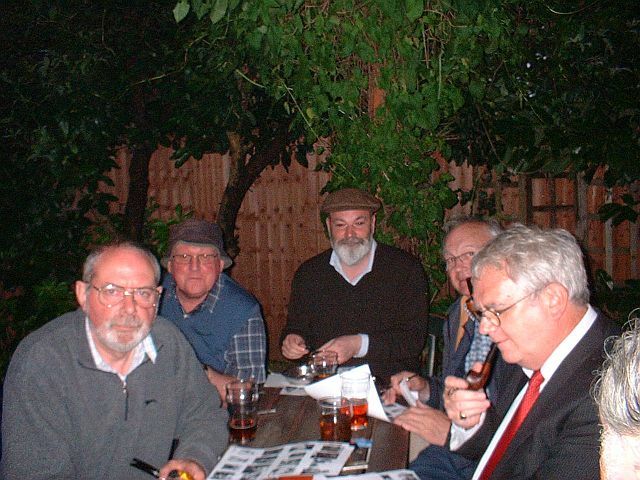 Those who attended the British Pipe Smoking Championships all said how enjoyable the event was. Hopefully, there will be another BPSC next year. And now for the main event of the evening... 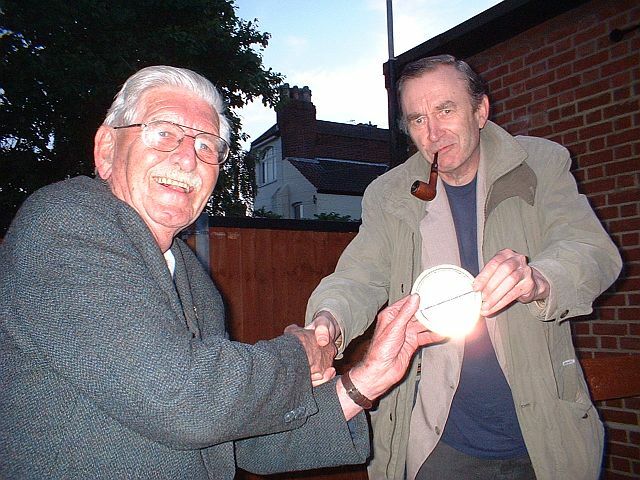 Thanks again to Ronnie Bobbin for another excellent picture quiz which was won by Mr Eason who was presented with a tin of Dunhill Navy Rolls. 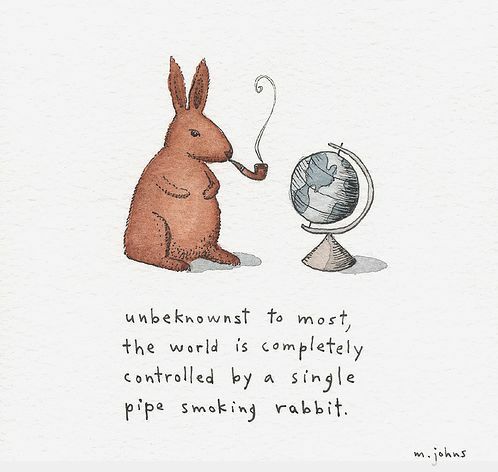 I don't know where John stores all the trivia that he knows. Three PCN members attended the BPSC on 15th July. Overall, times were slow. David Wollard-Kingston did exceptionally well, coming second with a time of 50 minutes. Tony Larner was sixth with 30 minutes and Keith Coleman smoked for 15 minutes. There were approximately 27 contestants and everyone won a prize. Which is nice. We would like to thank Brian Mills and the Hollingsworth club for organising the event and hope that they will put on another one next year. 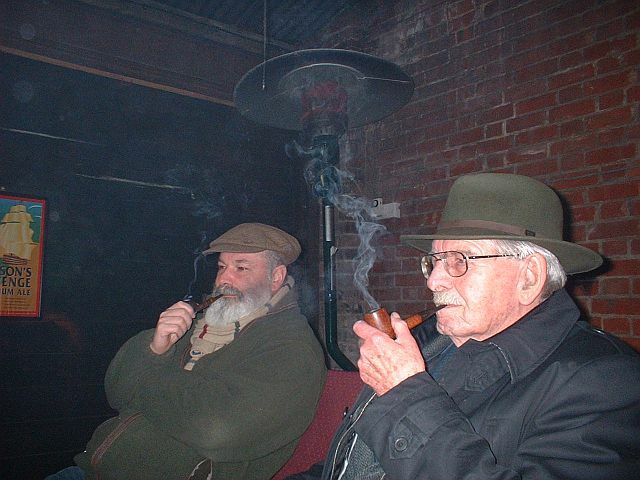 "A Spaniard out smokes his competitors to win the crown at the British Pipe Smoking Championships on Sunday; prior to the competition smokers are allowed to inspect their pipes and await any rule changes. Then the competition packs are handed out to each competitor. Each pack contains three grams of tobacco, a tamper, competition pipe and two matches in the matchbox. Clive Davis explains that smoking is a relaxing hobby: "It's a relaxing hobby, I mean most of my cigarette smoking friends will nip outside for a quick smoke but you can't nip outside for a quick pipe, the shortest pipe is going to last 10-15 minutes, quite often it can last for half an hour so you have to make time, you have to schedule a little part of your day to go and have a smoke and that helps you relax, " After fifty minutes of competitive smoking only two competitors were left, the victor was 48 year old Spanish solicitor from Barcelona, with a time of 58 minutes and 7 seconds. Winning the modest race earned bragging rights and several tins of tobacco." 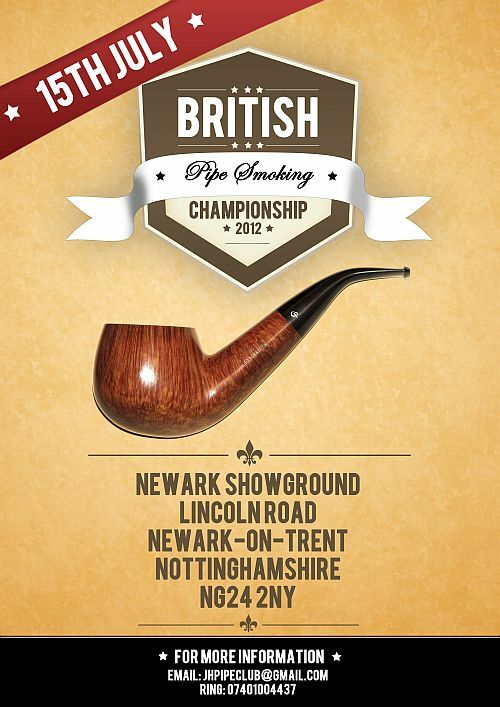 The British Pipe Smoking Championship 2012 will take place at Newark Showground on Sunday 15th July. Timings and menu below. Flat 1, 102 Fore Street, Exeter, EX1 2RS. Here's hoping that this year will be a great success as in the past. 11.00hrs. Opening of exhibition and confirmation of registration. 12.00hrs Meeting of club secretaries/representatives to discuss future of the UKFPC. Prize giving at completion of event, or, perhaps, a little after! Open and closed sandwiches, Hot'n'kickin chicken, Garlic bread, Fish goujons, Mini savoury tartlets, Puff pastry bites, Assorted pizza slices, BBQ flavoured mini pork ribs. The tobacco for the event will be Grousemoor. Well done to Len for winning this year's outdoor competition which took place at the Fat Cat and Canary on Thorpe Road. 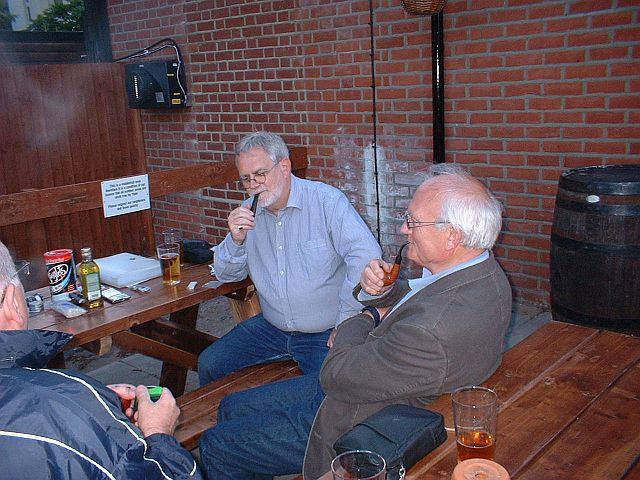 This newly-refurbished pub (formerly the Mustard Pot) has excellent outdoor seating areas and a superb choice of beer. Well worth a visit. John and Frank find something amusing. Tony is not so sure. 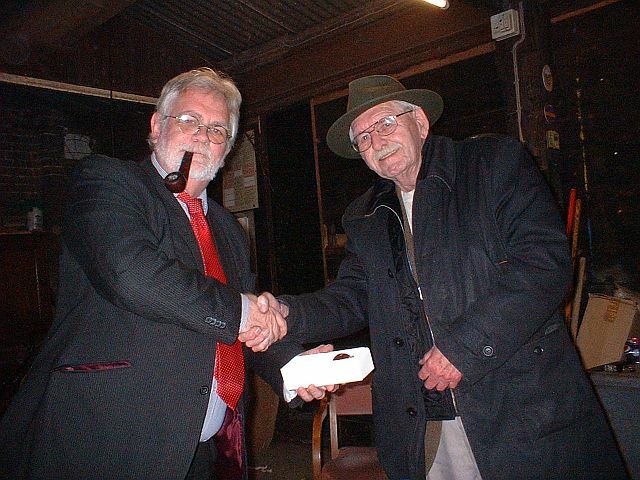 Winner Len receives a tin of Dunhill Navy Rolls from the secretary. Well done to David for winning this year's 4 grams competition, retiring at the 56 minutes mark. David won the cigar competition. 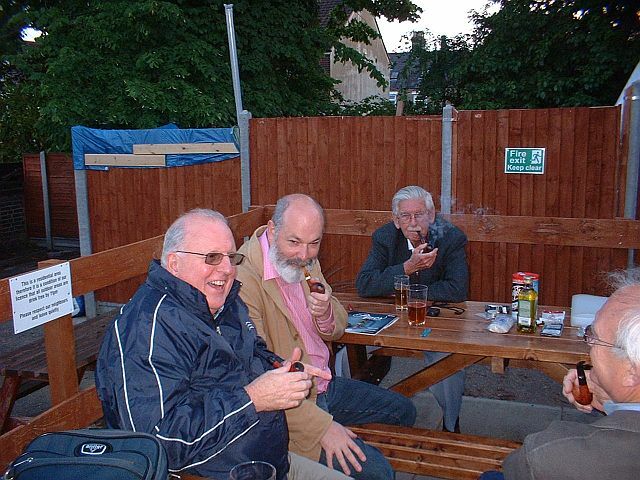 The club is very sad to report that Keith Garrard passed away on 23rd March 2012. 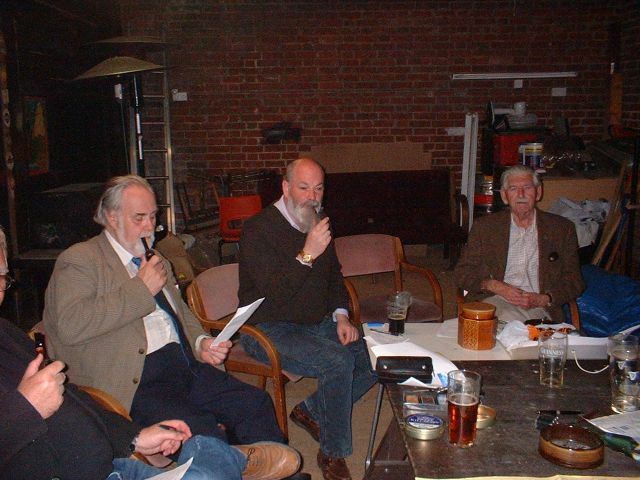 Keith was a member of the club for many years, serving as secretary and organising the annual PCN Championship. We remember him for the hard work and effort that he put into club activities. 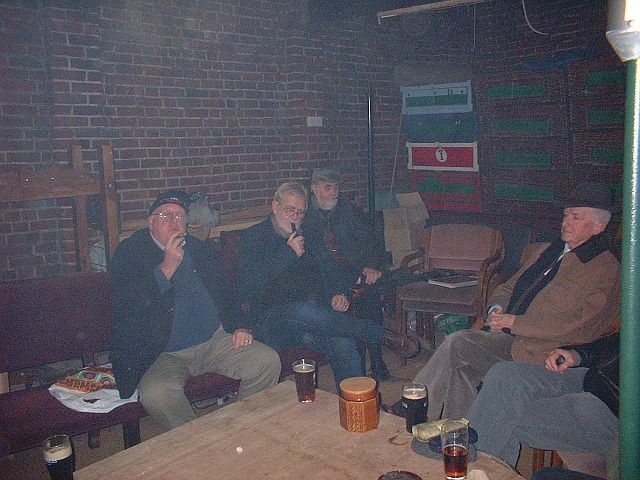 Keith had many friends up and down the country amongst the fraternity known as 'Brothers of the Briar'. 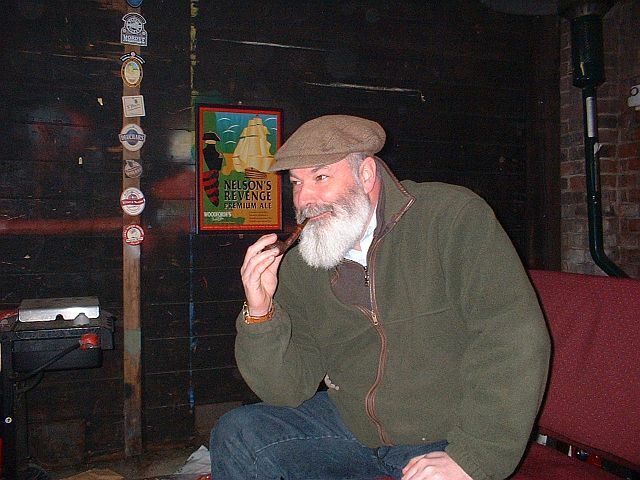 Keith worked for many years as a bus conductor before being employed at Churchills tobacconists in Norwich, an establishment that he later took over. We shall all miss him greatly. We all send our sincerest condolences to Keith's family. Keith's funeral and celebration of his life was held at St Faiths crematorium on Friday 20th April at 3.30pm, and afterwards at the Jubilee, St Leonards Road, Norwich. Keith was given an excellent send-off with over 100 people attending the funeral and many going to the drinks afterwards. We were particularly pleased to see Richard Neville and PCN member David Polhill, both of whom had travelled a long way to attend the funeral. Donations to the Big C appeal , please. A sampling evening with three mixtures and three flakes available to test. Well done to David for winning this year's 3 grams competition. One of the most interesting AGMs for years. Sadly the secretary resigned for personal reasons. Everyone at the club would like to thank Keith Garrard for his many years of hard work and service to the PCN. 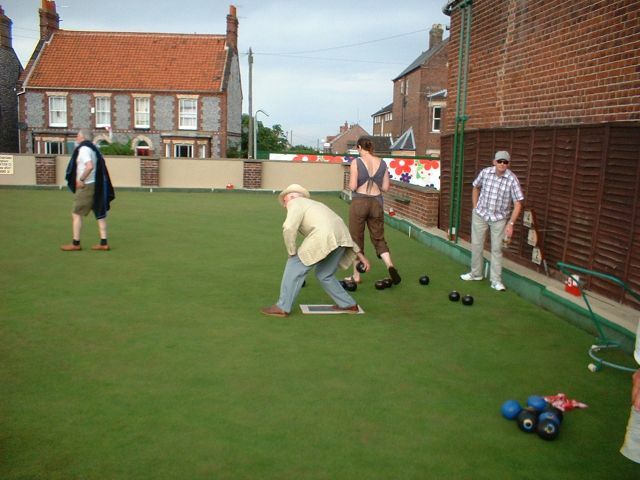 Keith used to organise the Norfolk Open Championships for us, a task that involved a lot of work. Thank you, Keith. 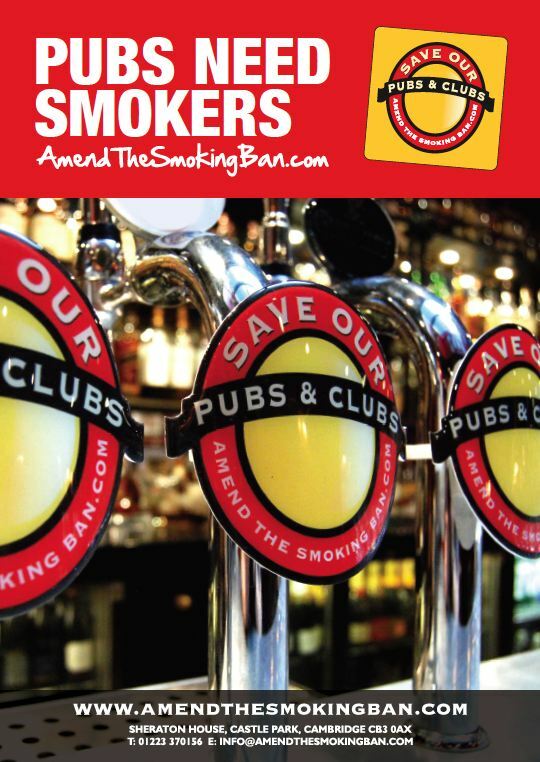 The PCN sponsored the 2011 Broads Awards for Most Smoker Friendly Pub which was won by the New Inn, Horning.